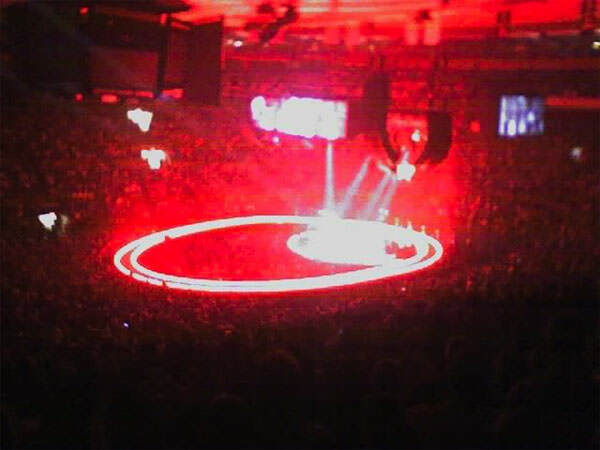 Went to see U2 at Madison Square Garden last night. The show was great. I was in section 336 row J, which was off to the right side of the stage, at about the opposite 40 yard line (assuming the big scoreboard in the center of MSG is the 50 yard line). We were pretty far away, but we got see the entire stage and the light show was great. There was a good mix of HTDAAB songs, recent album songs, and older songs. I checked out the published set list on u2.com before heading to the show so I had an idea what to expect, but it changed right before the show because it looked to me like a stagehand taped down a setlist about 15 minutes before U2 took the stage, only to pull it up and tape down a new one about 5 minutes before. It also looked like Bono called an audible for the very last song of the night because he whispered something to The Edge then shouted over to Larry and Adam before playing Vertigo a second time. According to the published set list on u2.com it was supposed to be “40”. For me, the best part of the evening was Where The Streets Have No Name because Bono let the audience sing the first two verses and sounded great, and the lights really came up so you could see almost 20,000 people singing in unison, which was kinda cool.